We had a good team leader today. It was warm and sunny. I learned to properly water the moss and stones and got to do it in the early morning. 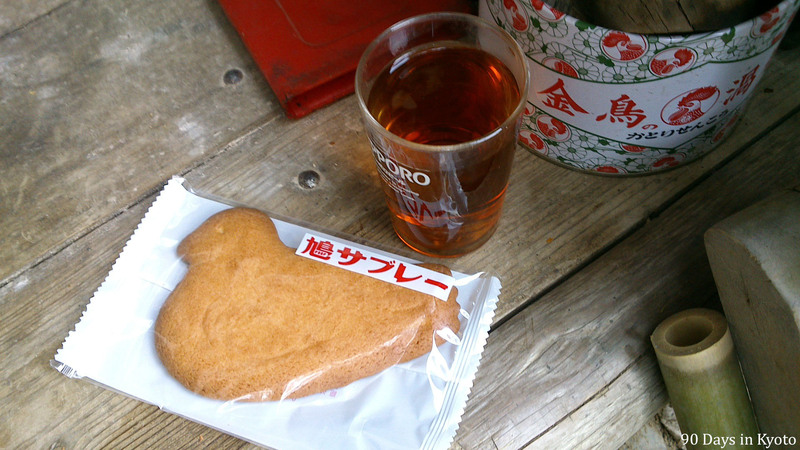 During the lunch break, we often receive sweets or senbei (rice crackers) from the temple – Our treat today was a shortbread cookie called Hatto Sabure (Sable) from Kamakura, which tastes like my mum’s christmas cookies. I used the breakfast break to practice my otoko musubi (male knot), one of the standard knot types every Japanese gardener knows. 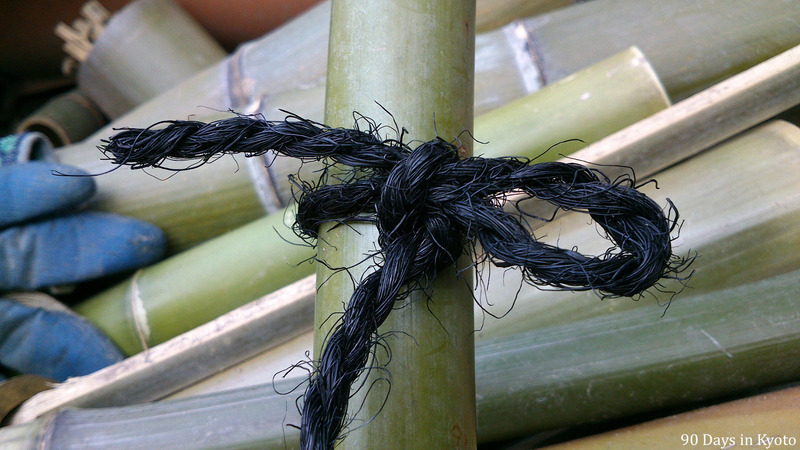 The string is called Shuronawa (棕櫚縄). It is really rough and dyed in a deep black, so my fingers were black and raw. 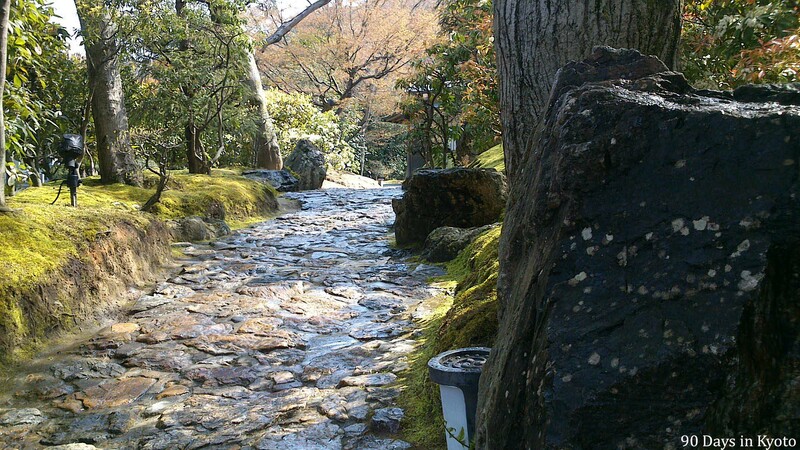 Our team leader took us on a walk through the neighborhood of the temple AND bought us matcha ice cream, which we enjoyed under the cherry trees… Can it get more “Kyoto”? 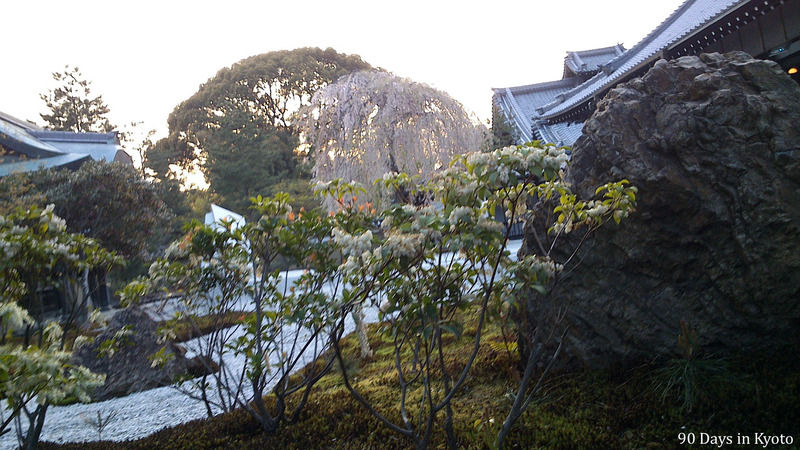 The best is yet to come: I got to water the karesansui (rock garden) in front of the Hojo, the main hall of the temple. Which means that 20,30 pairs of eyes are watching your every move. It is a pretty cool job and I was proud to be allowed to do it. The gardens are beautiful today. The fresh green leaves of the sakura came out today – which means that the sakura season is over soon. But since short flowering sakura is a symbol for the fugacity of life, the green leaves mean to me more substance, more stability, more accountability. I am looking forward to the new greens in the garden. Keep the pics coming I want to see it all!